Only €10 to add 043 landline. Your €10 includes for Ireland and UK landline calls. Broadband Advanced very high speed option is ideal for those who transfer large amounts of data across the Internet, listening to music and watching video. Having speed like this you’ll never think twice before hitting the download button again. 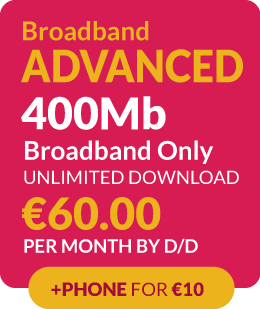 With our Broadband Advanced package you can instantly preview a movie, watch a news clip, get up-to-the-minute stock quotes, sports scores, play online games, or simply surf the web…fast, very fast, and all for €60 per month! Cablecomm can deliver such high speeds because we use our own fibre powered network.